HMC4000N marine genset controller integrate digitization, intelligentization and network technology which are used for genset automation and monitor control system of single unit to achieve remote start/stop, data measurement, alarm protection and etc. functions. It fit with LCD display, optional languages interface (Chinese and English), and it is reliable and easy to use. 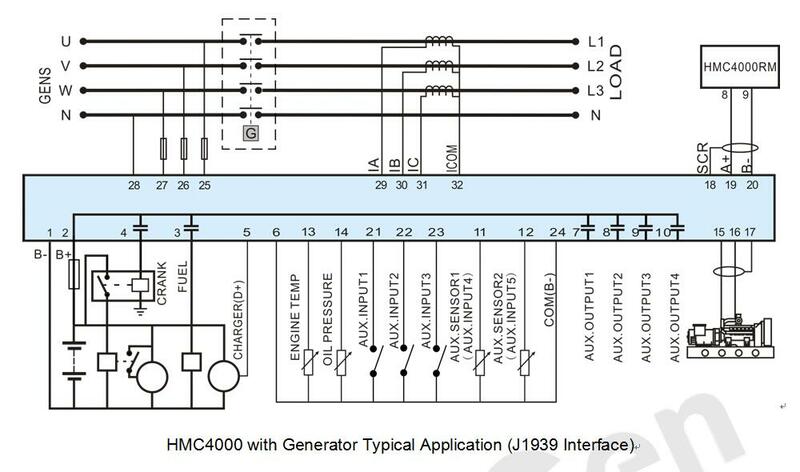 HMC4000N marine genset controller adopt micro-processor technology with precision parameters measuring, fixed value adjustment, time setting and set value adjusting and etc. All parameters can be configured from front panel or through USB interface via PC. It can be widely used in all types of marine genset control automation system with compact structure, advanced circuits, simple connections and high reliability. Note: HMC4000MPU speed is collected by head sensor. HMC4000CAN speed is collected by J1939 CANBUS. 132x64 LCD with backlight, selectable language interface (Chinese and English), push-button operation. Equipped with CANBUS port and can communicate with J1939 gen-set. RS485 communication interface can connect with remote control modules. In remote control mode, it is easy and convenient to remote control engine start/stop（local start/stop keys are deactivated）. With override mode: in this mode, only over speed shutdown and emergency shutdown can stop the engine. Collects and shows 3-phase voltage, 3-phase current, power parameter and frequency of generator. Protection: real-time monitor and control diesel generator-set running status, and any faults occur it will shutdown in time and record alarms. Parameter setting: parameters can be modified and stored in internal FLASH memory and cannot be lost even in case of power outage; most of them can be adjusted using front panel of the controller and also can be modified using PC via USB port. With multiplex input port 4 and 5. Input port 4 can be configured as discrete input port or sensor input (default as oil temperature sensor); input port 5 can be set as discrete input port or programmable sensor. It can flexible used in different occasions. With two programmable sensors can be configured as temperature, pressure or liquid level sensor. Multiple crank disconnect conditions (speed sensor, oil pressure and generator frequency) are optional. Widely power supply range DC(8~35)V, suitable to different starting battery voltage environment. All parameters used digital adjustment, instead of conventional analog modulation with normal potentiometer, more reliability and stability. Event log and maximum 99 event logs can be memorized. Waterproof security level IP65 due to rubber seal installed between the controller enclosure and panel fascia. Metal fixing clips enable perfect in high temperature environment.